I was introduced to the wonderful Michelle and Michael through Yvonne, the owner of Unique Melody Events. Yvonne suggested we pair up for the couple’s photos, so Michelle and I got in contact, and they decided to work with me right away! Not only did I get to capture their engagement photos, but I will also get to shoot their wedding this fall at Fulchino Vineyards in Hollis, New Hampshire! 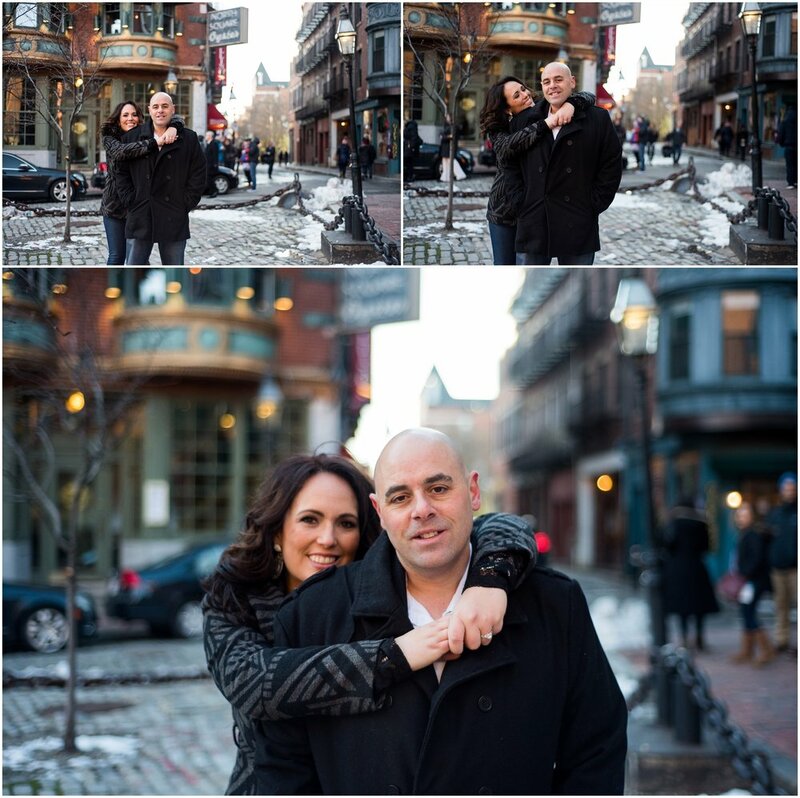 For their engagement session, Michael and Michelle started in the North End, on Hanover Street, before walking to the Waterfront. The city streets serve as the perfect backdrop for their love story. After spending a lengthy amount of time as Facebook friends (due to mutual involvement in a health and wellness company), Michelle and Michael first met in person in Spring 2017. It all started, though, because Michael commented on one of Michelle’s posts. After a few days of online chat, they agreed to meet up. Michael went into their meeting with a focus on networking; he wasn’t interested in meeting a new romantic partner. After a three hour date, they agreed to meet up the following weekend to see Guardians of the Galaxy II. The rest, as everybody says, was history. Not only do Michael and Michelle share a birthday, but they also share a limitless love for Michelle’s two little boys. Now, Michael considers them to be his own sons. When it came time for a proposal, Michael considered everything. For the ring, Michelle had fallen in love with a halo ring on Pinterest. The owner of the jewelry store stayed up all night (on his day off!) and found the exact ring. It was perfect! Michael chose a family vacation to Disney World - a place both Michelle and her family have always loved - for the timing of his proposal. On 1/18/18, he arranged for a private space in Epcot, in order to pop the question just before the park’s fireworks started. It was Michelle’s dream to be engaged at Disney, and to have a fall wedding. Michael is making both of them come true! This beautiful couple emulates gratitude and joy in every aspect of their relationship. And to think, it all started with a comment on social media! As Michael puts it, “One message. One moment. One marriage!” I can’t wait to see them again at their fall wedding!